To repair a foundation properly, Foundation Supportworks of the Tri States' Push Pier System uses rugged steel pier sections, driven deep into the earth's soil, to transfer the weight of your home onto competent, load-bearing strata or bedrock. 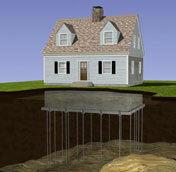 Not only does this foundation piling permanently stabilize your home's foundation, it also provides the best opportunity to lift your home back to its original, level position. 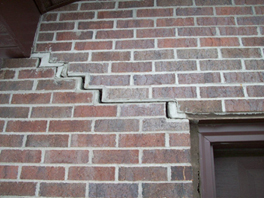 Call or contact us online for a Free Foundation Repair Estimate and Inspection. Foundation Supportworks of the Tri States installs of the Supportworks' Push Pier System is all below grade, which means the system itself will not be visible after installation to detract from the beauty of your home. Installations can be performed year round and do not require the use of heavy equipment, which can damage your lawn and landscaping. During push pier installation, heavy-duty steel foundation brackets are secured to your foundation's footings. Next, galvanized steel pier sections are hydraulically driven through the bracket to competent soils or bedrock. The weight of your home is then carefully transferred from unstable soil conditions through the piers onto load-bearing strata, resulting in the permanent stabilization of your home's foundation. Once this is completed you have the choice of either stabilizing your home at its present location or lifting your home back to a level position. Either way, Foundation Supportworks of the Tri States Push Pier System offers you the strength, durability, and lifespan of galvanized steel as well as the peace of mind of knowing your home is back on solid ground. We install push piers in Peoria, Quincy, Pekin, Galesburg, Burlington, Ottumwa, East Peoria, Hannibal, Macomb, Canton, Oskaloosa, Fort Madison, Keokuk, Fairfield, Mount Pleasant, Monmouth, Washington, and the surrounding areas in Iowa, Illinois, and Missouri. Contact us today for your free foundation repair quote! "Bix went beyond my expectations. This was the best contractor experience I've ever had."